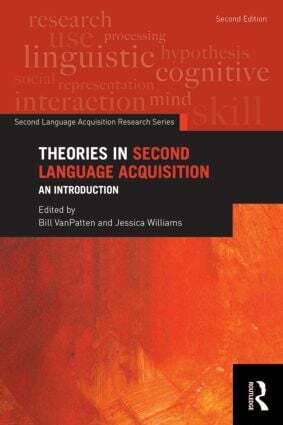 The second edition of Theories in Second Language Acquisition seeks to build on the strengths of the first edition by surveying the major theories currently used in second language acquisition research. This volume is an ideal introductory text for undergraduate and graduate students in SLA and language teaching. Each chapter focuses on a single theory, written by a leading scholar in the field in an easy-to-follow style – a basic foundational description of the theory, relevant data or research models used with this theory, common misunderstandings, and a sample study from the field to show the theory in practice. This text is designed to provide a consistent and coherent presentation for those new to the field who seek basic understanding of theories that underlie contemporary SLA research. Researchers will also find the book useful as a "quick guide" to theoretical work outside their respective domains. Bill VanPatten is Professor of Spanish and Second Language Acquisition at Michigan State University. Jessica Williams is Professor of Linguisics at University of Illinois at Chicago. The Second Language Acquisition Research series presents and explores issues bearing directly on theory construction and/or research methods in the study of second language acquisition. Its titles (both authored and edited volumes) provide thorough and timely overviews of high-interest topics, and include key discussions of existing research findings and their implications. A special emphasis of the series is reflected in the monographs dealing with specific data collection methods or instruments. Each of these monographs addresses the kinds of research questions for which the method/instrument is best suited, offers extended description of its use, and outlines the problems associated with its use. The volumes in this series will be invaluable to students and scholars alike, and perfect for use in courses on research methodology and in individual research.